MOSCOW, April 16. /TASS/. 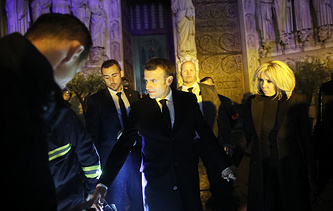 The United Nations Educations, Scientific and Cultural Organization (UNESCO) will discuss at its plenary session on Tuesday the issue of providing assistance to France in restoration of the Notre Dame de Paris cathedral that was damaged in the fire, Russia's Ambassador to UNESCO Alexander Kuznetsov told Rossiya 24 TV channel.